Relations between the United States and Russia have recently escalated from strained to outright aggressive. From imperial expansion in Ukraine to intervention in Syria to Russian hacking during the US election in 2016, it is clear that the United States must be prepared to defend itself and its NATO allies against Russian aggression. 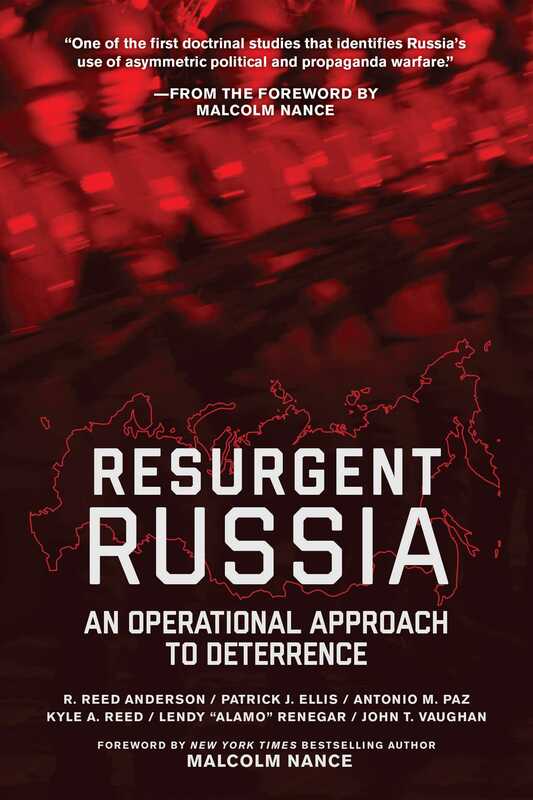 Resurgent Russia, researched and written by six residents and internationally experienced officers at the US Army War College, analyzes the current threat of Russian acts of war—both conventional military attacks and unconventional cyber warfare or political attacks—against the United Stated and NATO. The officers detail how the America can use its international military resources and political influence to both prepare for and deter aggression ordered by Vladimir Putin, making it clear that such an attack would be unsuccessful and therefore keeping the peace. This study provides a clear assessment of how the United States and its allies must utilize their political and military power to deter Russian aggression and maintain the hierarchy of power in today’s world. Lieutenant Colonel R. Reed Anderson is currently a member of the U.S. Army War College resident class of 2016, upon completion of which he will serve as the Chief of the Office of Security Cooperation at the U.S. Embassy in Tunis, Tunisia. Colonel Patrick J. Ellis has served in multiple command capacities in the Afghanistan, and is scheduled to take command of 2nd Cavalry Regiment (Stryker) in Vilseck, Germany. Lieutenant Colonel Antonio M. Paz is currently a member of the U.S. Army War College resident class of 2016. He has served in command positions on multiple tours in Iraq, Afghanistan, and Europe. Lieutenant Colonel Lendy "Alamo" Renegar is currently a member of the U.S. Army War College resident class of 2016. Upon graduation, he will serve as the chief of staff for the 438th Air Expeditionary Wing, Train-Advise-Assist-Command-Air (TAAC-AIR) in Kabul, Afghanistan. Lieutenant Colonel John T. Vaughan is an assault amphibious vehicle officer in the U.S. Marine Corps. Upon graduation from the U.S. Army War College, he will assume duties as deputy G-3, 5th Marine Expeditionary Brigade, in Manama, Bahrain.